Certified fighter aces of the storied 31st Fighter Group pose together in front of a P-51B Mustang. 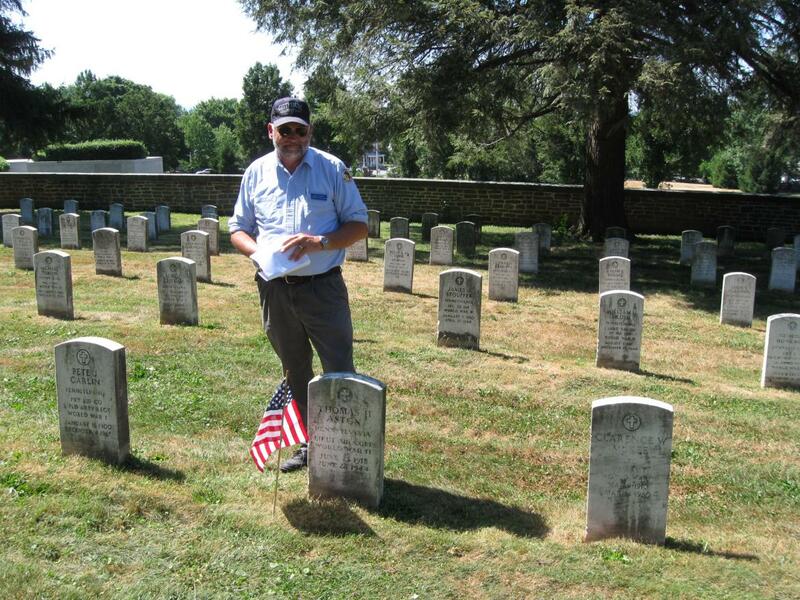 Captain Frederick Dorsch, who is buried in the Gettysburg National Cemetery, is on the far left in this photo. This photograph, taken circa the 1940s, is courtesy of the 31st Fighter Group Association. 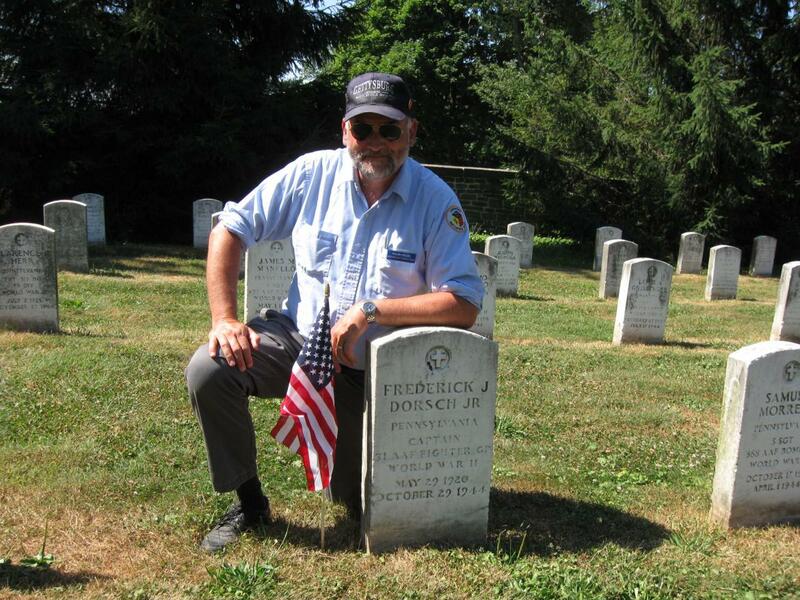 Resting near the Civil War dead – and overlooked by many visitors – are two seamen killed at Pearl Harbor, 11 who fell in the D-Day landings, an artilleryman killed in the infamous Malmedy massacre, the young pilots of B-17’s, B-24 Liberators, and B-26 Marauders, a P-51 fighter ace, and one boy from Allentown, Pa., who was killed in the Marine Corps’ first Pacific battle on Guadalcanal at the shocking age of 15. 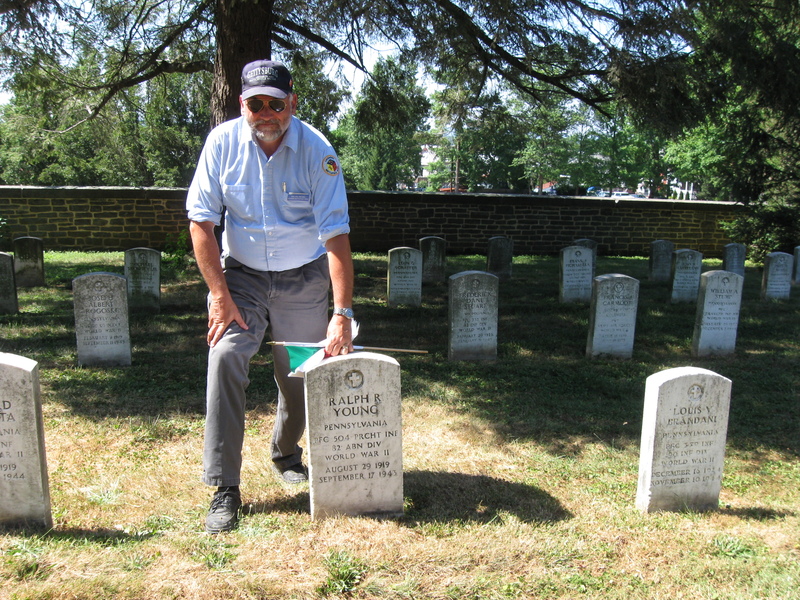 In today’s World War II at Gettysburg post, Licensed Battlefield Guide Ralph Siegel shows the the final resting place of individuals killed during the Italian Campaign, and in air operations in the Mediterranean Sea. 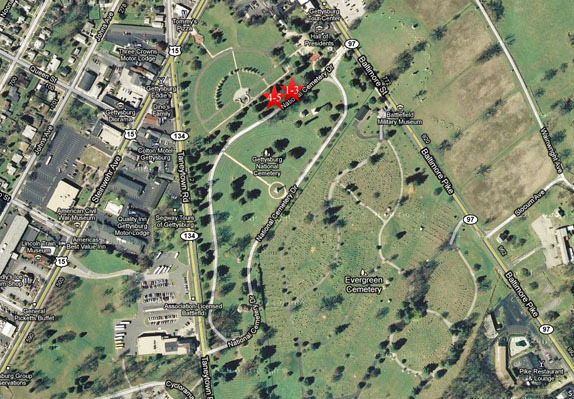 This map shows the location of the videos for the World War II at Gettysburg series. 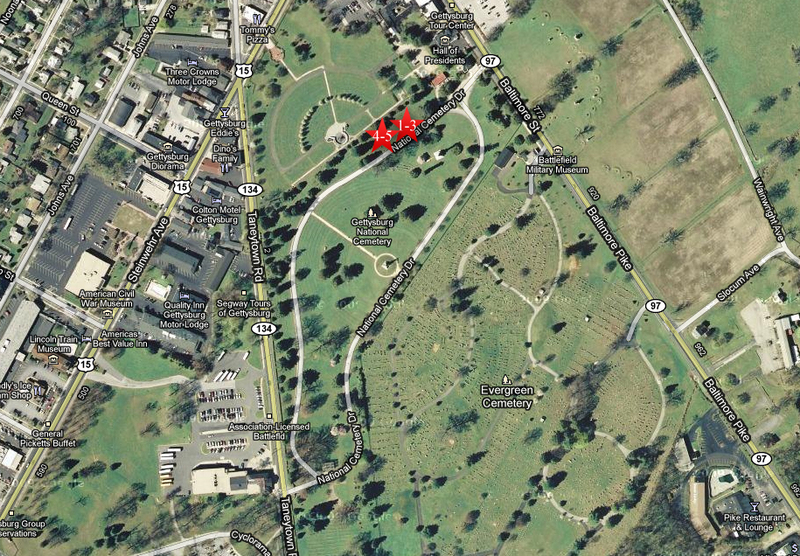 Videos #1-#5 were taken in Section 2 of the Gettysburg National Cemetery. 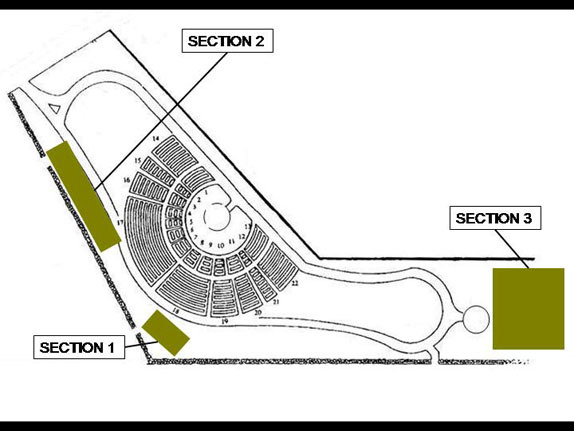 This map was created facing north at approximately 12:30 PM on Saturday, July 31, 2010. 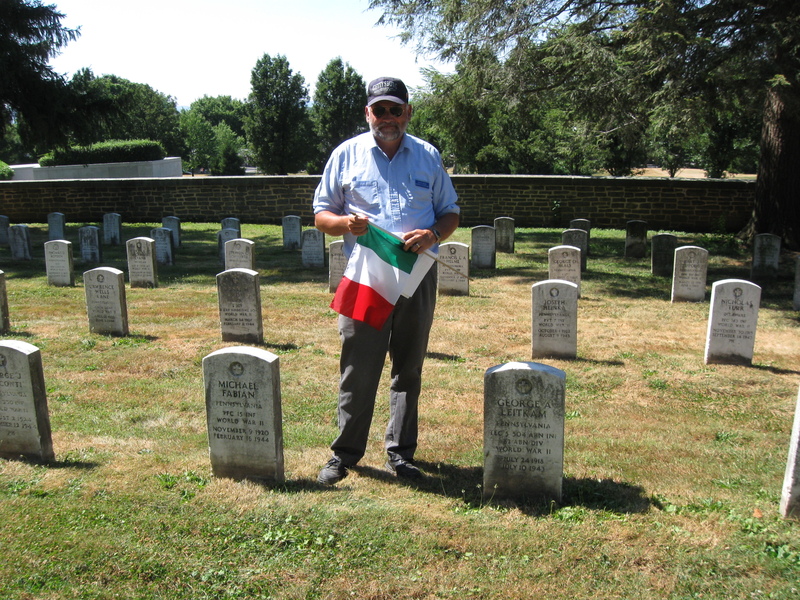 Gettysburg Licensed Battlefield Guide Ralph Siegel is holding an Italian flag as he stands by the headstones of two individuals who were killed in the Italian Campaign: Michael Fabian, killed at Anzio, and George Leitkam, killed by friendly fire during the invasion of Sicily. This view was taken facing northwest at approximately 3:30 PM on Sunday, July 11, 2010. In Video #4 (Videos #1-#3 were shown in the previous World War II at Gettysburg post) Gettysburg Licensed Battlefield Guide Ralph Siegel shows us the graves of individuals killed in the Italian Campaign. This view was taken facing northwest to north at approximately 3:30 PM on Sunday, July 11, 2010. 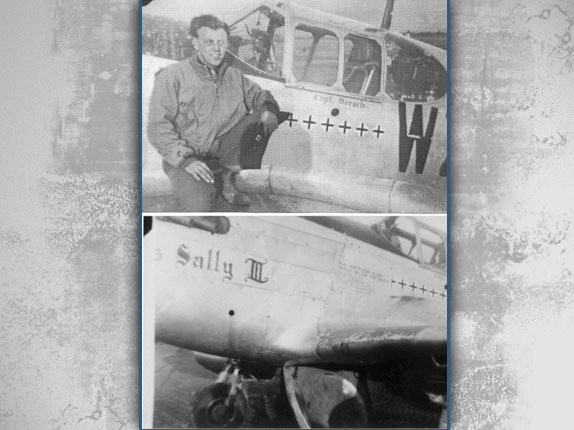 Ralph Young was a member of the 82nd Airborne killed at Salerno. This view was taken facing northwest at approximately 3:30 PM on Sunday, July 11, 2010. 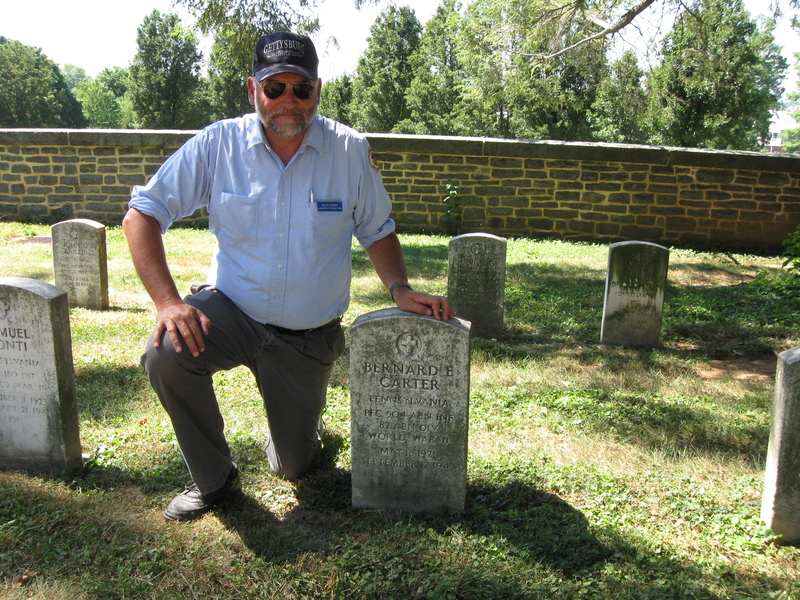 Bernard Carter was a member of the 82nd Airborne killed at Salerno on the same day as Ralph Young. This view was taken facing northwest at approximately 3:30 PM on Sunday, July 11, 2010. 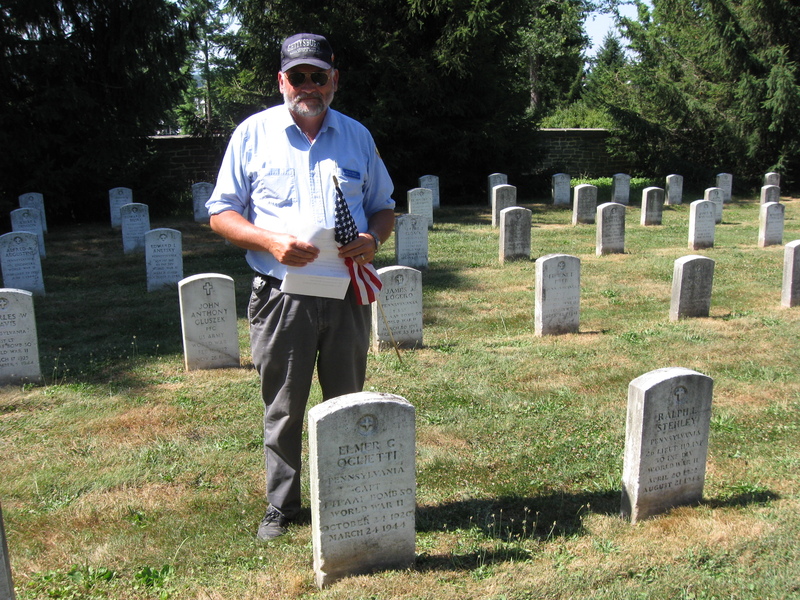 First Lieutenant George Beals was awarded the Silver Star for his actions in the Italian Campaign. This view was taken facing northwest at approximately 3:30 PM on Sunday, July 11, 2010. This generic combat mission photo of a B-26 Marauder shows the tight confines for the six-man crew in the type of aircraft flow by Captain Elmer Oglietti, the highest ranking airman buried in the National Cemetery. 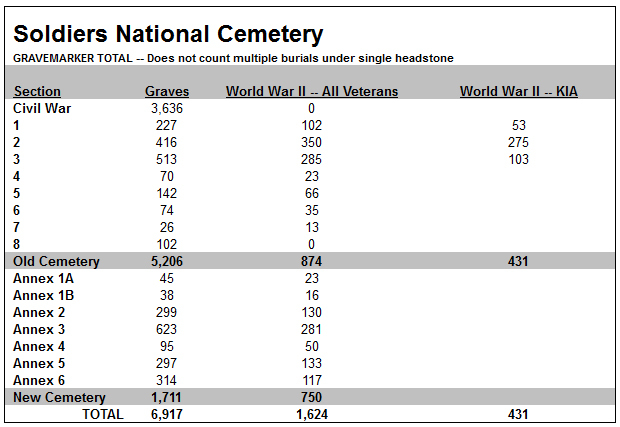 Source: U.S. Army/National Archive. 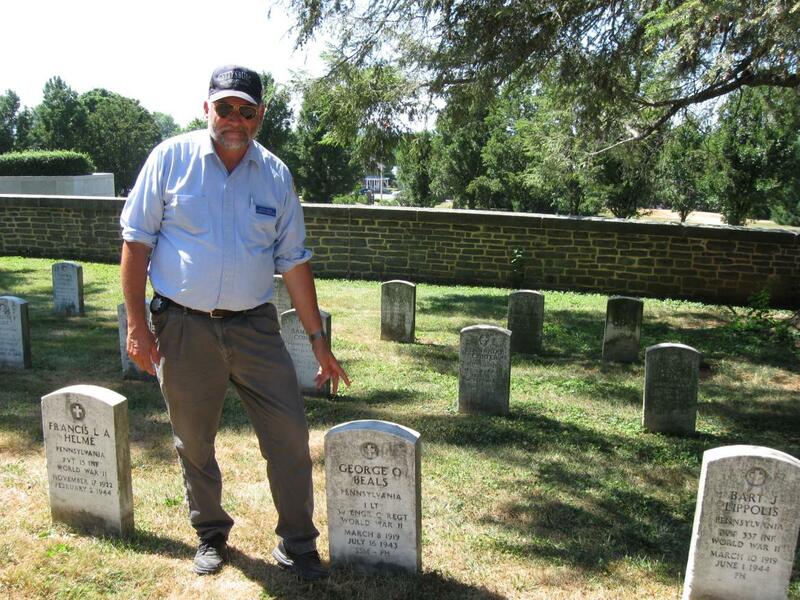 In Video #5 Licensed Battlefield Guide Ralph Siegel shows the graves of some airmen killed in the Italian Campaign. This view was taken facing northwest to north to southwest at approximately 3:30 PM on Sunday, July 11, 2010. 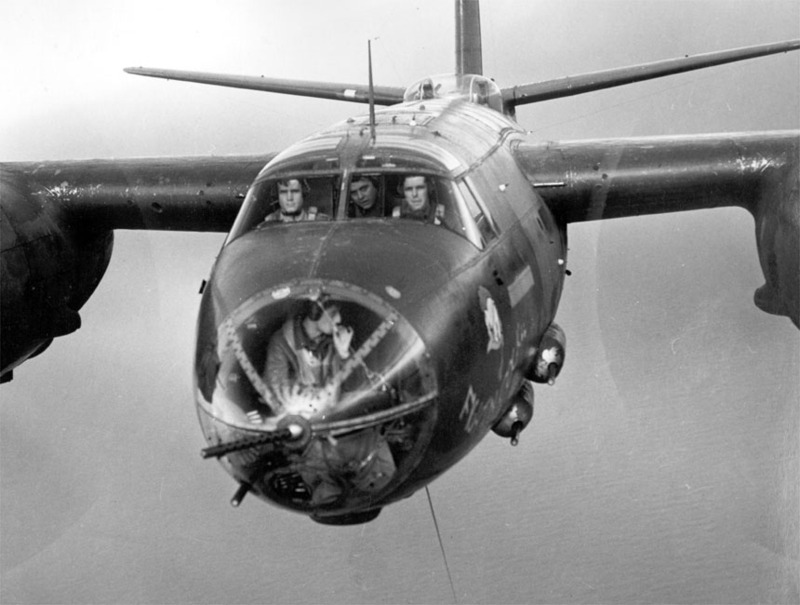 Captain Elmer Oglietti was killed on takeoff during his first mission as a squadron commander. This view was taken facing north at approximately 3:30 PM on Sunday, July 11, 2010. Captain Frederick Dorsch poses with his P-51B Mustang, the early version of the high-performance fighter plane that was similar in appearance to the British Spitfire. He and his squadron would soon be flying the more familiar P-51D with the bubble canopy. Courtesy 31st Fighter Group Association. 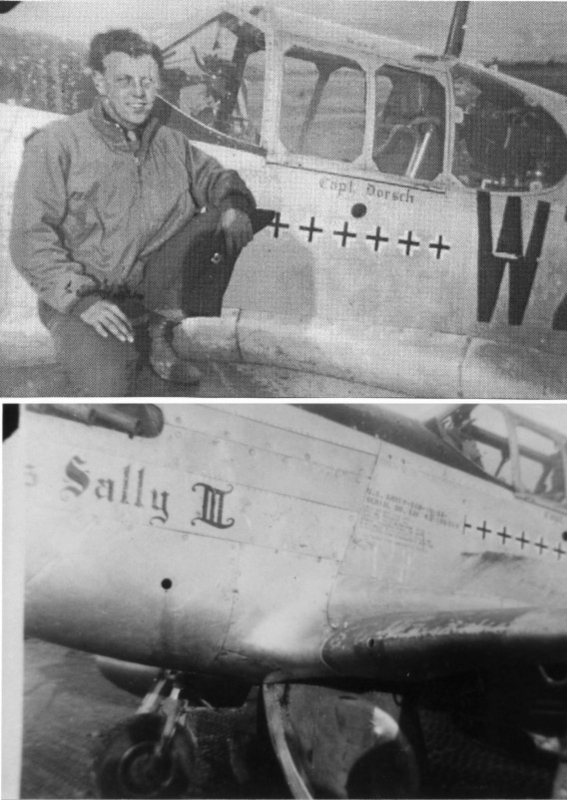 Captain Frederick Dorsch was a P51 Mustang pilot and fighter “ace” who had shot down eight German aircraft before he was killed in 1944. This view was taken facing northwest at approximately 3:30 PM on Sunday, July 11, 2010. 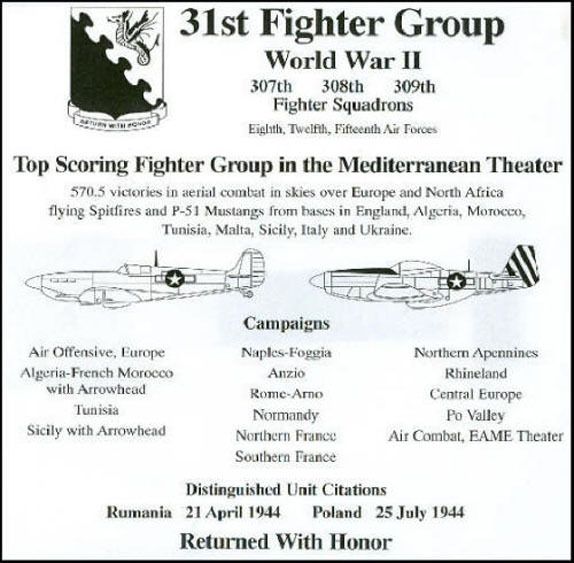 This plaque for the 31st Fighter Group appears at the Air Force Academy in Colorado Springs. Captain Frederick Dorsch was in the 309th squadron. Courtesy 31st Fighter Group Association. 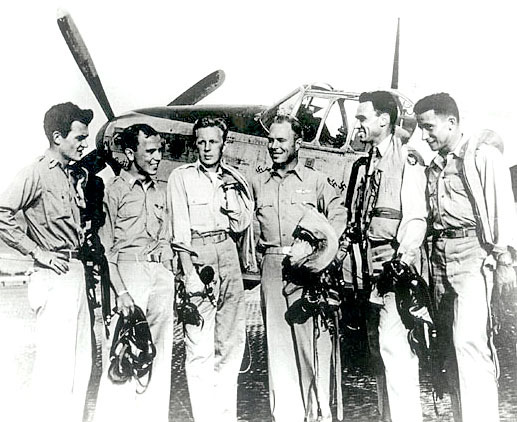 Lieutenant Thomas Aston had flown with Claire Chennault’s “Flying Tigers” before the United States entered World War II. He remained with the unit when it entered the uniformed services of the United States and became the 23rd Fighter Group. This view was taken facing west at approximately 3:30 PM on Sunday, July 11, 2010.